Need to stretch your legs, walk the dog, eat lunch, or take a bathroom break while traveling? Be glad you’re driving Texas highways. Long recognized for its many rest stops and travel centers, Texas Department of Transportation (TXDoT) is constantly improving facilities with more services for visitors. “We have a lot of long, isolated roadways in Texas where there’s really nothing else available,” says Andy Keith, director of the rest-area safety program for TXDoT. “We believe that these rest areas are needed for safety,” he adds. He has a point. According to the National Highway Traffic Safety Administration, fatigue-related crashes kill 1500 people a year and are implicated in more than 100,000 accidents. Benefitting from the national stimulus program of 2010, TXDoT has applied funds to rest areas in the hope of preventing motor accidents on lonely roads across open prairies as well as alleviating problems from truckers not having adequate places to take a break. 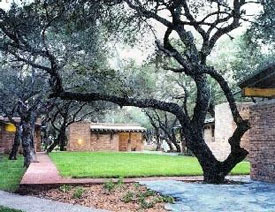 Each Safety Rest Area is designed to incorporate natural and historical features unique to its location, as well as native landscaping elements. For example the new rest area on I-10 in Chambers Country, built on property once owned by Texas pioneer and cattle baron James Taylor White, will display artifacts from the mid-1800s to give visitors on this popular route some historical perspective.